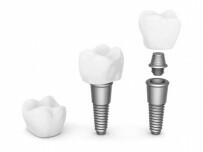 Implants are a seamless solution for removing problem teeth or filling the gaps in your smile caused by missing teeth. Each implant adheres directly to the jawbone – just like natural teeth – replacing your root structure as well as the tooth and strengthening the area. Implants can be used in combination with dentures, bridges and crowns and they exist independently, so that the surrounding healthy teeth are preserved. You’ll be able to smile confidently knowing that your new implants are indistinguishable from your natural teeth. Since dental implants are designed to adhere directly to your jawbone, there are some specific health requirements for interested patients. If you’re looking to replace one or more of your teeth, stop by our office today to talk with us and see whether you would be a good candidate for dental implants!